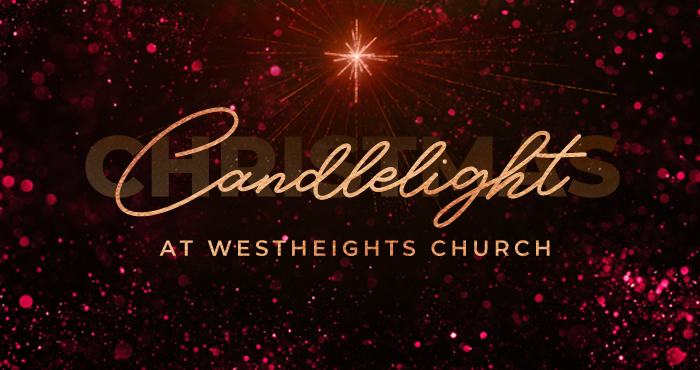 The Christmas Candlelight Services will be held on Sunday, Dec 23 at 7:00 pm, and Monday, Dec 24 at 4:00 and 7:00 pm. This is a highlight of the year for us at Westheights. We come together as family and friends and neighbours, seeing familiar faces and new ones to meet. We remember and fill our hearts with this amazing truth: Jesus came for us. It is a beautiful service filled with carols, candlelight and, of course, Christ. It is a perfect opportunity to invite family and friends. Our heart is to create a service that is powerful and meaningful for every person that attends. Each year I am struck and honoured by the number of faces I don’t recognize coming to celebrate Christmas with us. This is a service for families to experience together and we love that. All ages are welcome in the service. However, we also recognize that kids can get wiggly! Therefore, childcare will be available for kids under age 3. As well, due to safety considerations, battery operated candles will be available for children rather than real ones. Thanks for your understanding. We look forward to celebrating together the beautiful message of this season: Jesus came into our world to be Emmanuel, God With Us.